Our 14th annual Hut trip makes a return back to the 10th Mountain Hut system. 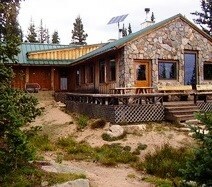 While it has been amazing exploring other huts in the state in years past, nothing can really compare to the majesty of a true 10th Mtn Hut, especially the one we'll visit this year: Skinner Hut, by Leadville, is perched at 11,620' at the edge of a cliff overlooking the Glacier Creek valley and Turquoise Lake. Of all the huts we've visited, this is perhaps the most scenic setting. We will spend the weekend exploring the area at your own pace. Cost of $180/person covers lodging and all meals. Due to support vehicle limitations, this trip is capped at 12 participants. This event was added on 3/5/2015 by an RMBB member and was last updated on 11/20/2015 by an RMBB member.